Grande Dunes consists of two 18 hole golf courses – The Resort Club and Members Club – both of which are some of the top golf courses in the Myrtle Beach area. The Resort Club at Grande Dunes was designed by the Roger Rulewich Group and opened back in 2001. Since the opening of the course, the rave reviews and accolades have continued to surround the Resort Club. In 2009, the Grande Dunes Resort Club took the top honor of “National Golf Course of the Year” by the NGCOAA (National Golf Course Owners Association of America). Locally, it has been the top course in the Sun News’ Best of the Beach seven times. 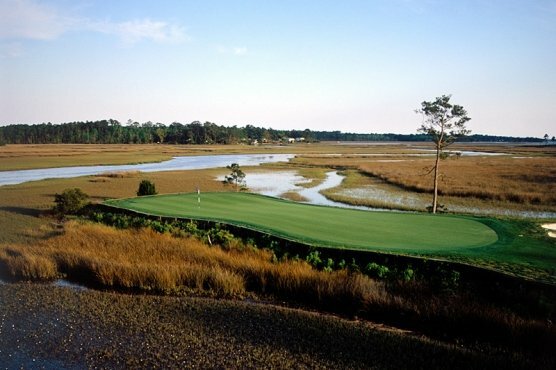 Grande Dunes Resort Club is a great addition to any Myrtle Beach golf package. The location of this spectacular golf course is what makes the scenery and setting so stunning. The Grande Dunes Resort Course is on a bluff that runs along the Intracoastal Waterway creating a stunning backdrop for your round of golf. This links style Myrtle Beach golf course has wide fairways with undulation that lead to large, Champion Bermuda manicured greens. The two most notable holes on The Resort Club at Grande Dunes are the Par 4 9th hole that runs parallel to the Intracoastal Waterway with views of the boating access and the Par 3,14th hole with a menacing forced carry water shot across the Waterway. As equal frightening as beautiful, the 14th hole is the perfect place to stop and grab a photo from the tee box. Be sure to take advantage of the amenities when you add Grande Dunes Resort Club to your list of golf courses to play during your Myrtle Beach golf package. Stop by the golf shot (National Merchandiser of the Year accreditation) and pick up an article of clothing for your family members, grab a bite to eat at the clubhouse – either dine inside or outside, and as usual warm up on the driving range and practice your chipping and putting on the practice green before teeing off for your round. If you need some instruction, the Golf Academy at Grande Dunes is available for you as well.